The Hradec Králové modern art gallery is the charcoal grey building mid way along the northern side of the main square. 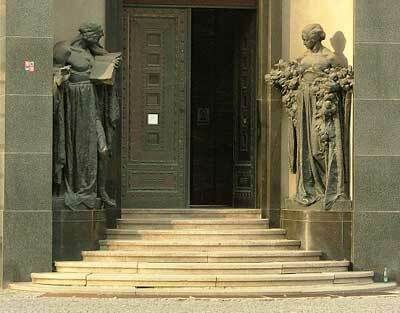 Six or seven steps lead up to a pair of massive bronze doors flanked on either side by huge statues of the gods of business and bounty. The ticket desk is to the left, just inside the wooden-framed revolving door, but you’ll probably find your eyes following the staircase upwards towards the skylit ceiling. When the ticket lady catches your attention, she’ll ask you whether you want to see the permanent collection (30Kč), the temporary exhibition on the ground floor (20-50Kč depending on what’s on) or both. The temporary exhibitions change every few months and the gallery’s official website is the best place to find out what will be on during your visit. The permanent exhibition covers the entire four floors of the building, and the paintings sculptures and drawings on display represent some of the best Czech artists of the twentieth century. Especially the period before the Second World War. If you visited Litomyšl before Hradec Králové, you might recognize the first of the really valuable artworks. ‘The supper’, ‘The victim’, and ‘Invokers of the devil’ are canvasses in Josef Váchal’s distinctive style. The other big name of Czech impressionism on this floor is Emil Filla. He’s represented by his paintings ‘Dance of Salome’ and ‘Sleeping in third class’. On the next floor the collection of paintings continues, and there’s a separate room with sketches of Czech surrealist artists. Jan and Eva Švankmajer and Toyen are the big names here. This collection of drawings is almost an exhibition within an exhibition and even has its own name - Krajina s fantomem (landscape with a phantom). On the third floor the collection of canvasses and sculptures continues, and the highlights are works by Toyen, Josef Čapek and Jan Zrzavý. The fourth floor is mostly sculpture, with lots of pieces by Karel Nepraš . You might recognize the style if you’ve seen the horseback monument to author Jaroslav Hašek in Prague. It’s one of his. There are a couple of sculptures also out on the rooftop terrace. I wasn’t sure whether I was allowed to go out, but the custodian waved me on. The views of the square are better even from there 495 514 893than from the lookout platform of the white tower. In all, a pleasant way to spend an hour or two of any visit to Hradec Králové and a good way to invest 30Kč.